If you are a true Harry Potter fan then you are going to love these fun Hogwarts houses button set. The button come in a set of 4 one for each of the Hogwarts houses and that means you will get your own Gryffindor, Ravenclaw, Slytherin, and Hufflepuff. Each of the pin back buttons are 1.25 inches in diameter and show the cool crest of the house. So now you can have a button on your clothing or maybe you bag that shows the house that is on your mind today. Of course, you could wear all 4 buttons on your outfit as it really makes a statement that Harry Potter is still on your mind everyday of the year. If you are a Harry Potter fan then you need to check out this Slytherin onesie pajama. The onesie is made for men but will look great on women to and it comes in sizes Small – XL and is made from 100% polyester. The pajama is one piece and looks like the Slytherin costume any Slytherin students at Hogwarts would wear. Besides as a cool pajama for sleeping and lounging and it works great as a cosplay or Halloween costume. And this Harry Potter onesie has a hood too so that even your ears stay warm while napping and dreaming about Harry Potter. Is your newborn baby a Harry Potter fan? 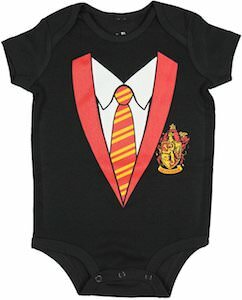 If they are then this Hogwarts school uniform baby bodysuit is what they need. This baby bodysuit comes in 4 different kinds so that you can dress your baby the way the sorting hat wants. Just pick between Gryffindor, Slytherin, Hufflepuff, and Ravenclaw and then all you have to do is pick a size between 6 and 24 months and your baby is ready to go to Hogwarts in their new uniform bodysuit. The Harry Potter baby bodysuit is black and made from 100% cotton and on the front, you can see the shirt and tie and the crest matching the house of your choice. Now you can have a Harry Potter corset top that makes you look like a Slytherin house member. The corset top is black and green with the big crest of Slytherin with the snake on the front. And the back of this corset is black with laces but don’t worry putting it on is easy as it has a zipper on the side. And the Slytherin corset even has a removable tie to make it look even more real. You can get this Harry Potter costume corset in women’s sizes Small – 3XL so that it fits you perfectly. Why get one pair of Harry Potter socks when you can get 5? This is a set of 5 pairs of ankle socks and each pair is different. 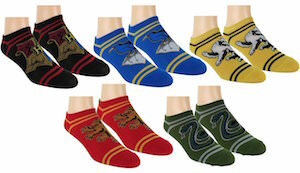 There is a pair for Hogwarts, Gryffindor, Ravenclaw, Slytherin and Hufflepuff. Each pair is in the house colors and has the logo on it. So now you can be part of a different Hogwarts house every time you change you socks. These women’s socks fit shoe sizes 4 – 10 and are made from 70% Polyester, 20% Nylon and 10% Spandex. You can never have enough socks and specially not cool Harry Potter socks so why wait when you can have 5 pairs of different Harry Potter socks yourself. 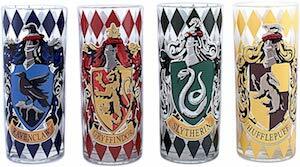 If you think that you belong in Slytherin house then you should take a closer look at this Harry Potter mug. 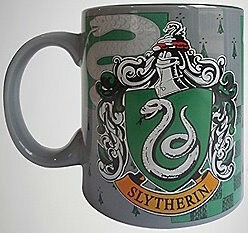 This grey mug has the crest of Slytherin on it and that makes this a great looking piece of Harry Potter memorabilia. Now your morning coffee can be out of this special mug. The snake logo really comes out nicely on this Harry Potter mug and that could be one of the reasons why you would want this mug. Home or work a mug like this is just perfect as by drinking of it you can dream off to Hogwarts for a minute. Hogwarts School of Witchcraft and Wizardry has many different houses for the many students, if you are a fan of the house Slytherin then why not show it off with a really awesome pair of leggings. Featured on the Harry Potter leggings are the unmistakable Slytherin crest on each outter thigh, the entire leggings are a very fitting pattern of green and white stripes that are vertical and really stand out. These legging are a one size fits most, a wide range of sizes can fit this basic pattern which has measurements of: Waist: 23.62 inchs, Hips: 40 inchs, Thigh: 19.68 inchs, Ankle: 7.87 inchs, Length: 38.18 inchs. 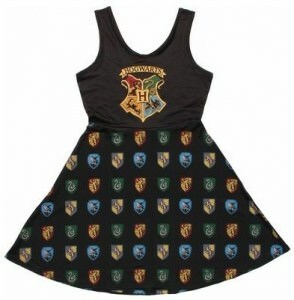 Harry Potter and the School of Witchcraft and Wizardry has many games and events to challenge their young wizards, support the school with a super cute dress. The top of this dress features a tank style top that is all black and has a large scoop neck with the Hogwarts School of Witchcraft and Wizardry logo from the awesome series of movies Harry Potter. The mini skirt is flared out and has a series of multiple logos of all the different houses of Hogwarts, Gryffindor, Hufflepuff, Ravenclaw and Slytherin. Made to be very comfortable and perfect for any occasion this Hogwarts A line dress is available in women’s sizes that range from Small to XL. Show off your house pride in the Harry Potter Hogwarts Scoop Neck Dress. Harry Potter fans will love these lounge pants. You can choose between 4 different designs and these Harry Potter pants are unisex so men and women both can enjoy this amazing gear. So what do you get? These are dark grey lounge pants with 2 pockets and elastic waistband with a string to get them to fit the way you like. And on the left leg (when you wear the) you have the logo and name of the house the sorting hat send you to. These pants come in a Ravenclaw, Hufflepuff, Gryffindor and Slytherin version for all the house in Hogwarts. 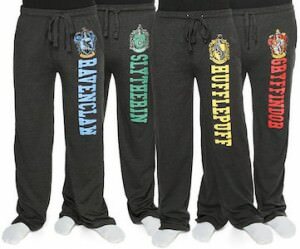 And these lounge pants are available in a wide range of sizes from Small – 2XL and if that doesn’t fit then a little bit of Harry Potter magic will make the into the right size. Surprise yourself or a friend with the favorite Harry Potter House Lounge Pants.